In the throes of winter, in my mind, I am enjoying a nostalgic trip back to our summer in France last year. 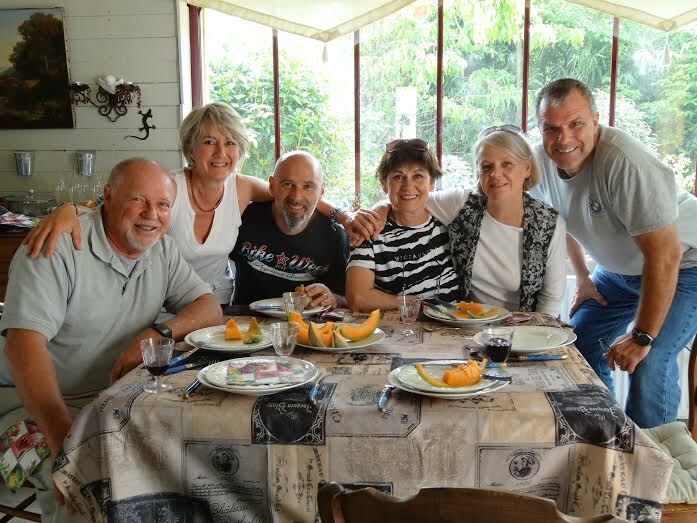 Our French friends Carole and Laurent (2nd and 3rd from left) graciously welcomed David, me, and our friends Tulin (center)and Dave (on right), into their home in Tours. We had many fine meals with them. Carole is a wonderful cook. Her magret of duck cooked in peaches is sublime, as is her fois gras and ratatouille. But I have been thinking most about her stuffed vegetables. 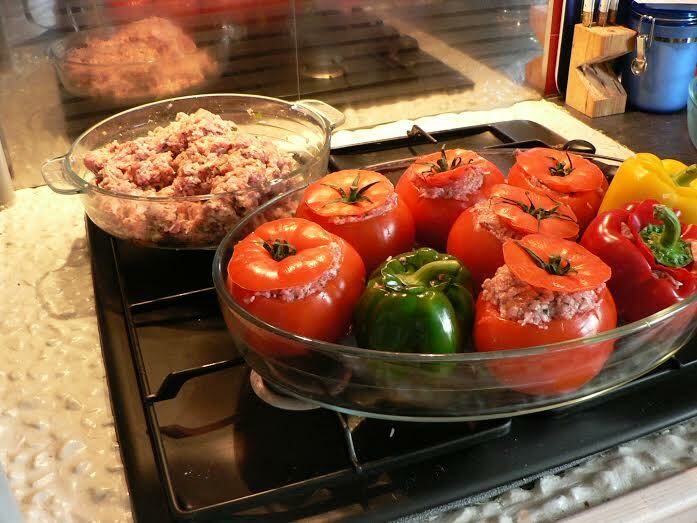 The stuffed tomatoes and peppers turned out to be a collaboration between Carole and Tulin; a little bit French from Carole and a little bit Turkish from Tulin, who is originally from Istanbul. I wish that I had paid more attention to the ingredients that they used. I was a bit jet-lagged at the time. All I know is that every bite of the casserole was eaten with relish. When I attempted to duplicate this dish, I used peppers and zucchini because they are readily available this time of year. I avoid tomatoes in winter. My inspiration was a recipe from Giada De Laurentiis. Now we have an Italian spin. But I guess the point is that many cultures have recipes for stuffed vegetables. 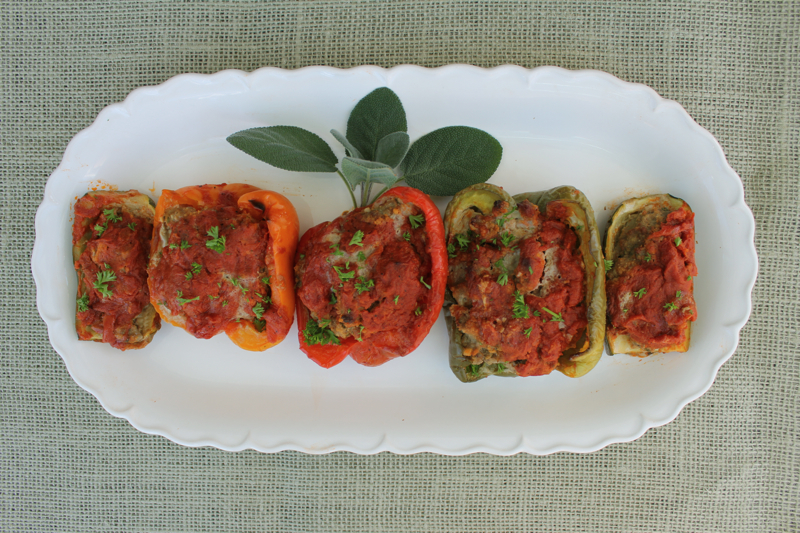 Whatever the cuisine, there is great flavor in stuffed vegetables. And I was able to taste again, the wonderful food that we shared last summer. 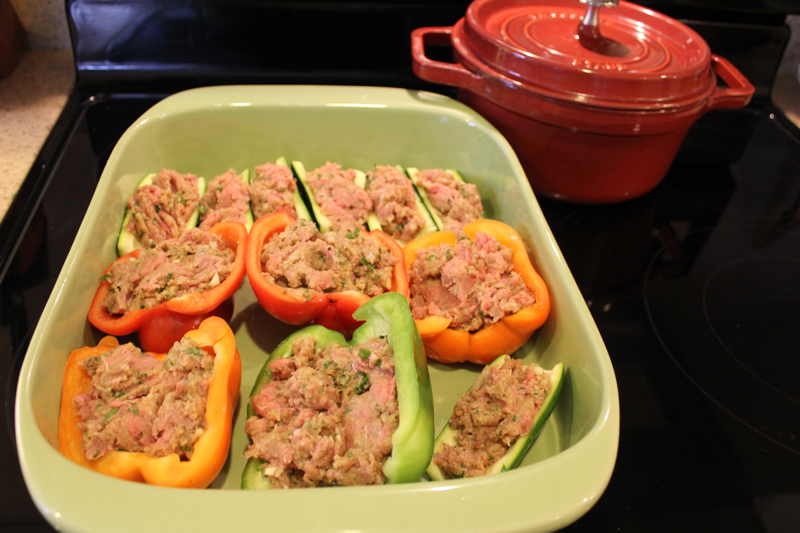 I am calling these stuffed vegetables “Provencal” because of the bright colors, the use of olive oil, garlic and herbs, and because visiting sunny Provence was one of the highlights of our trip. Bring a little Provencal sunshine to your table as well. Lightly drizzle the olive oil into a 13 by 9 by 2-inch baking dish.Whisk the onion, parsley, egg, ketchup, garlic, salt, and pepper in a large bowl to blend. Stir in the cheese and bread crumbs. Mix in the turkey. Cover and refrigerate the turkey mixture. Posted on January 22, 2014 at 7:10 am. Welcome to my new Word Press website. I still have some technical issues to work out, but I am happy with the design and look of my updated blog. Thanks to my talented Son and Daughter-in-Law for their expertise. If you encounter any problems in leaving comments or with any other issue please email me at pennyklett@gmail.com. Thanksgiving is an excuse for wonderful leftovers in my opinion. Every year I make an extra pumpkin pie just so I can have it for breakfast for a week. 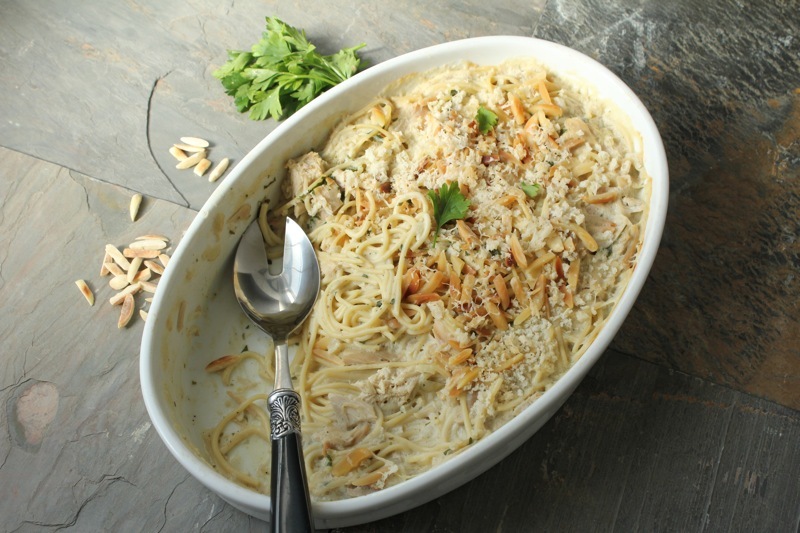 But turkey tetrazzini has always been my reason for roasting a turkey. It is just as much a tradition as the Thanksgiving dinner itself. I have been using the same recipe for years and it will be difficult for me to be specific about proportions because everything is now done by rote. But one thing I have learned over the years is to use less pasta than you think you will need because the pasta absorbs a lot of the sauce while it bakes. Enjoy this simple dish made from leftovers. It goes well with that leftover cranberry sauce too. In large skillet melt butter over medium heat. Add flour and whisk flour and butter together until it turns a light brown. Mix together wine and chicken broth. Add to skillet. Continue whisking until sauce thickens. Add 1/2 and 1/2 and turkey. Cook until heated through. Mix in cooked spaghetti. Add a little pasta water if it is dry. Pour contents of skillet into a greased casserole. 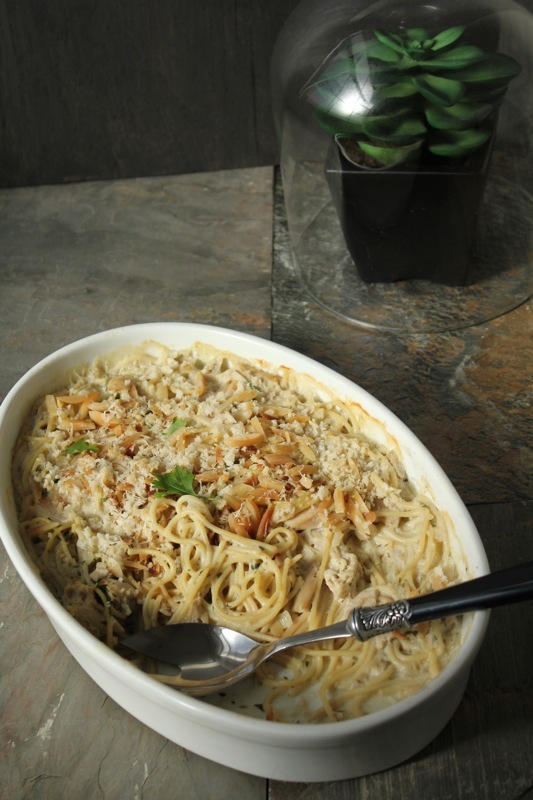 Sprinkle top with almonds, panko crumbs and Parmesan cheese. 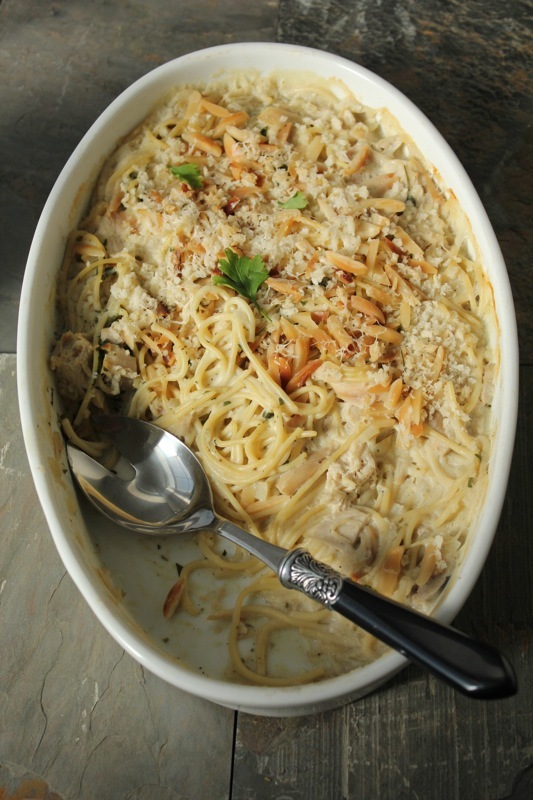 Bake casserole until bubbly and cheese and breadcrumbs are browned. (About 20 minutes). Posted on November 26, 2012 at 8:24 am. For the month of November I have decided to do a countdown to Thanksgiving. When you think about it, Thanksgiving is a time for a variety of dishes from soup to desserts. Most of the dishes are seasonal in nature and they are true comfort foods. All are criteria for the kind of foods I like to cook. The recipes will be in no particular order, but they will all be dishes that you would be proud to put on your Thanksgiving table. I will probably not give you a recipe for your Thanksgiving Turkey because everyone is pretty set in their ways in the method they like to use in cooking the big bird. But this first recipe is for those of you who do not want to cook a whole turkey. There have been years when there have just been the two of us for Thanksgiving or just us and another couple. This is a perfect dish for those occasions. It is excellent at any other time of year also. Turkey Paupiettes are nothing more than turkey breast cutlets wrapped around a savory stuffing, cooked in apple cider and surrounded by baby onions, crispy apples and tart cranberries. While I was preparing this last night, David kept coming into the kitchen to see what smelled so good. When I served it, we could not believe how well all of the components worked together. It was Thanksgiving on a plate. Serve this with either mashed potatoes or mashed sweet potatoes. The sauce is delicious. There was one change I had to make in the recipe. Neither Supermarket that I frequent had turkey cutlets or breast tenderloins. I had to buy thin sliced chicken breasts and pound them to make them larger. Do not be put off by the number of steps needed to make this. It is far less time consuming that making several dishes for Thanksgiving. It was worth the work. Make the stuffing: On a sheet pan toss the bread with the melted butter, the marjoram, the thyme, and salt and pepper to taste and bake the mixture in a preheated 350 F. oven for 15 minutes, or until the bread is toasted lightly. In a large heavy skillet cook the celery, the garlic, the apple and the onion in the butter over moderately low heat, stirring, until the vegetables are softened, add the broth, and bring the liquid to a boil. Stir in the bread mixture and stir the stuffing until it is combined well. Divide the stuffing among the tenderloins, mounding it in the center, and starting with the short ends roll up the tenderloins to enclose the stuffing. Secure each end with a wooden pick and pinch the edges together to seal in the stuffing. In a large heavy skillet heat the butter over moderately high heat until the foam subsides and in it saute the paupiettes and the white onions, turning them, for 8 to 10 minutes, or until the paupiettes are browned. Add the cider, bring the liquid to a boil, and simmer the mixture, covered, for 12 to 15 minutes, or until the turkey is tender. Transfer the paupiettes with a slotted spatula to a platter, removing the wooden picks, and keep them warm covered loosely. Add the broth to the skillet and bring the liquid to a boil. Stir the cornstarch mixture, stir it into the cider mixture, and cook the sauce, stirring, unti it boils and thickens. Stir in the apple slices, drained well, and the cranberries, cook the mixture, stirring, for 3 to 5 minutes, or until the fruit is heated through, and stir in the minced parsley and salt and pepper to taste. Spoon the mixture around the paupiettes and garnish the dish with the parsley sprigs. Serves 6. Posted on November 3, 2010 at 6:01 am. When you read a novel, do you do what I do? No matter what the dire straits the main characters find themselves in, I am always comforted by the interludes when they stop for a meal. Sometimes it is nothing more than a thick sandwich of pastrami on rye eaten over the kitchen sink with grainy mustard dripping seductively out around the edges. Sometimes in the middle of a murder trial, the beleaguered defense attorney finds solace in a hastily prepared meal of a cheese omelet and buttered toast washed down with a good Cabernet. No matter the seriousness of the drama unfolding, I judge many books on how they address food. I can stand only so much suspense and drama. I need the grounding presence of people who eat and enjoy food to keep me interested. Is it just me? It could just be one of my quirks because I am such a foodie. One of the hardest parts of being on this diet is I feel like one of my favorite toys has been taken away from me. Food in all of it’s guises fascinates me. I would probably be happy just reading cookbooks for the rest of my life. So . . . . I am bored with what I have been eating and I feel like I have nothing to say on my blog. But I do know what I have to say about this turkey meatloaf. It is really good and it has given me comfort in the middle of this weight loss campaign. And to tell you the truth it is lower in calories and fat than a standard meatloaf. Also I am down six pounds now and that is keeping me motivated. This turkey meatloaf is from the Barefoot Contessa and I have been making it for a few years now. I have always loved it. It just occurred to me that it would fit in well with our eating program, so we invited our fellow Weight Watcher friends over for dinner last night and shared it with them. It makes a lot of meatloaf. I halved the recipe and we still had leftovers. Hmmm, maybe a meatloaf sandwich for lunch eaten over the sink today with mayo dripping seductively around the edges . . . no . . . better hold the mayo for now. Oh well, don’t get bored with me. We are going to Key West next week and I promise pictures of Sloppy Joe’s Bar. But I may not eat one. Do you think Hemingway would approve? Combine the ground turkey, bread crumbs, eggs, and onion mixture in a large bowl. Mix well and shape into a rectangular loaf on an ungreased sheet pan. Spread the ketchup evenly on top. Bake for 1 1/2 hours until the internal temperature is 160 degrees F. and the meatloaf is cooked through. ( A pan of hot water in the oven under the meatloaf will keep the top from cracking.) Serve hot, at room temperature, or cold in a sandwich. I did not use the pan of hot water. Posted on February 19, 2010 at 5:30 am.